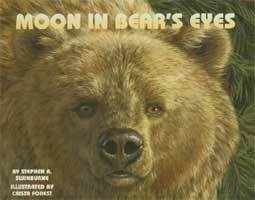 This attractive book describes the daily life of a grizzly bear family that lives in Yellowstone National Park. The interesting overview, which reads like an adventure story, includes basic information about the behavior, social structure, growth and development, habits, and characteristics of this endangered species and causes for its endangered status. Additional facts are presented in the author's afterword. A list for further reading, including Web sites, completes the work. Lavish, painterly-style oil illustrations beautifully depict the grizzly bears and their habitat. The readable text is printed on panels that resemble the bark of a tree. Presented in a straightforward manner, this solid introduction will be a handsome addition to any picture-book nonfiction collection. A few years ago I visited Yellowstone National Park to do research on my book called ONCE A WOLF. While I was there I had the opportunity to watch grizzly bears. After watching grizzlies a few days in a row, I came up with a story about a mother grizzly and her two cubs that come out of hibernation and tangle with a male grizzly. Make up your own story about a bear. Research your favorite animal. Give an oral presentation about that animal. Make a list of all the different type of bears. Use a Double-Bubble” map to compare and contrast two types.